Several Relief Expeditions were mounted during 1861-2 and these found traces of the Burke and Wills Expedition. Alfred Howitt found the bodies of Burke and Wills and discovered the sole survivor, John King. He dug up their note-books and maps at the Dig Tree and returned them to Melbourne. He marked and mapped Wills' grave, Burke's grave and the Dig Tree, as well as identifying several of Burke's camps between Menindee and the Cooper. John McKinlay also visited the graves of Burke and Wills and added his blaze to that of Howitts at Burke's grave. He also discovered a body he believed to be that of Charley Gray at Lake Massacre. Frederick Walker discovered traces of the Expedition at the Flinders River and located the most northerly camp, Camp 119. He blazed a tree here and mapped the site. There have been a number of attempts to retrace the explorers' tracks since the expedition crossed the country in 1860-1861. On 23 December 1870, George McGillivray left Eddington Station near Julia Creek on horseback and travelled via the Diamantina River, Cooper Creek and Strzelecki Creek to Beltana and then Wilcannia on the Darling River. This trip is often (incorrectly) credited with being a retracing of Burke's route. On 19 December 1882, George Ernest Morrison ('Chinese Morrison' or 'Peking Morrison') left Normanton and walked to Melbourne, arriving on 21 April 1883. His story of the walk, which he described as 'no feat of endurance - only a pleasant excursion' was published in The [Melbourne] Age and [Melbourne] Leader. Although Morrison was sometimes 400 kilometres east of Burke's route, recently his trip has been reported as 'retracing Burke and Wills' route'. In 1909 Mr R T Graham, manager of Magowra Station, reported finding blazed trees on his property. The trees were 22 miles south-west from Normanton on the east bank of the Little Bynoe River. A special meeting of the council of the Royal Geographical Society of Australia (Queensland Branch), was held on Thursday 23rd September 1909 and they elected to verify and photograph the trees and establish the position of the camp. RGSA (Qld) Secretary, Dr James Park Thomson, took the train from Brisbane to Gladstone, the SS Maranoa to Townsville and then the SS Kuranda to Cairns. They traveled overland to Normanton by coach and rail and then horse-buggy to Magowra. The site on the eastern bank of the Little Bynoe River was surveyed, photographed and mapped. Burke's Camp 119 and Frederick Walker's camp of January 1862 was relocated. In February 1915, the outback adventurer Francis Edwin Birtles and his bulldog 'Wowser' left Sydney and spent six months crossing Australia in a Ford motor-car. Birtles had already crossed the country several times by motor-car and bicycle, but on this occasion he made a film of his six month trip. The film titled 'Across Australia - On the Tracks of Burke and Wills', was released by The Co-Operative Film Exchange Ltd of Melbourne and opened at Melbourne's Hoyt's Olympia Theatre on Christmas Day 1915. Queensland grazier, Alfred Cory Towner (1901-1965) of Blackall, Queensland spent considerable time retracing the expedition, starting in 1947. Although his diary and notes have never been published, he marked the track by erecting a number of signs and memorial markers. Towner blazed a tree in the bed of Cooper Creek at the place he believed Wills had died and subsequently Mike Steel, Joe Mack and Eric Loffler placed a memorial cairn at the site. Towner also erected a sign at Lake Massacre close to where he believed Charley Gray had died. In 1977 Tom Bergin and Paddy McHugh took camels from Cooper Creek to the Gulf of Carpentaria to establish if travel during the summer months had proved detrimental to Burke's progress. ABC TV made a documentary and Bergin produced two books about the expedition. Army Aviation Base - Birdsville to Innamincka, 1989. In 1982 Graeme Wheeler identified a blazed tree on Bulloo Downs Station which he believes marked Burke's Camp LII. "Rendezvous at Camp 52 with Burke and Wills", Graham Wheeler, Geo: Australia's Geographical Magazine. 1987, Volume 9, Number 2, June-August. In 1983 Roger Collier and the Lake Massacre Expedition identified a tree near Towner's sign which they believed marked Gray's Grave. David Corke disputes this site and believes Gray was buried further to the west near Amagoorannie. The site is heritage listed on the Register of the National Estate. In 2006 it was proposed to remove heritage listing and Roger Collier succesfully petitioned the DEH (SA) to keep the site protected. During the 1980s David Corke and students and teachers from Preshil School identified a number of blazes marking Burke's camps from the Cooper to the Diamantina. Corke also replotted the site of Wills' death and an additional memorial cairn was erected by Joe Mack at the revised location. Beyond the Cooper: Burke and Wills, some missing links. Gabriel White & Martin Meyer. 1992, Preshil Camping Club, Kew. ISBN 0646109472. In 1995 Chris Tangey discovered artifacts which could have been deposited by Wills on the return from the Gulf at Camp 32R. 'Searching for Burke and Wills', Daphne Sider & Chris Tangey, The Melbourne Age. 9th December 1995, Travel Supplement, p. 9. In 2000 David Hillan surveyed the area to the north of Camp 119 and identified the most northerly point Burke reached. In addition, Hillan erected a marker at Burke's most northerly camp (Camp 120) and relocated Frederick Walker's camp of January 1862. 'Burke and Wills: The Gulf Team', Anthony Hoy & David Hillan, The Bulletin. Volume 118, No. 6210, 8th February 2000. pp. 50-53. In 2001 Richard Cork rediscovered the sandstone cave where Burke, Wills, Gray and King sheltered from wet season storms on their return from the Gulf of Carpentaria. 'The Search for the Sandstone Cave', Richard Cork, Gary Fischer & Wayne Walker. The Inaugural Burke & Wills Outback Conference : Cloncurry 2003 : a collation of presentations. 2005, Dave Phoenix, Cairns. pp. 21-38. ISBN 0646447025. In 2007 Professor Frank Leahy published a paper in Spatial Science outlining the search for Return Camp 46, the Plant Camp.' Dr Ray Holmes announced the discovery of artefacts in the area and in 2008 the area was protected by Heritage Listing. 'Locating the Plant Camp of the Burke and Wills Expedition,', F J Leahy, Department of Geomatics, University of Melbourne. Journal of Spatial Science, December, 2007. Volume 52, No. 2. Abstract: William John Wills was appointed Surveyor and Astronomer to the Victorian Exploration Expedition (now popularly known as the Burke and Wills Expedition) which departed from Melbourne on Tuesday 21st August 1860 with a party consisting of 17 men, 26 camels, 28 horses and 6 wagons. By April 1861, the forward party of 4 men, were struggling back from the Gulf of Carpentaria on short rations and with failing camels. To lighten loads, Wills planted (for later recovery) some equipment, including his astronomical instruments. This paper reports on an analysis of Wills navigational records with the aim of locating the site Wills named Plant Camp. The investigation has run for some 20 years without detailed publication. The reason for publishing now arises from a recent discovery, at the site identified as Plant Camp, of a small number of items that give every appearance of being part of the equipment planted by Wills. 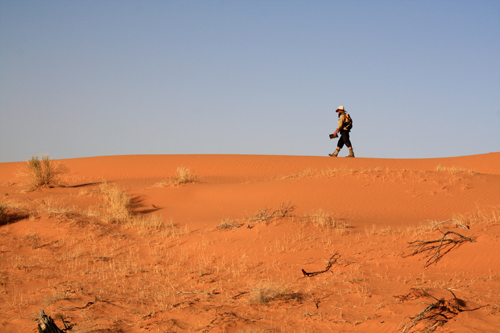 In 2008 Dave Phoenix walked 3,752 kilometres across Australia from Melbourne to the Gulf of Carpentaria retracing the Expedition. Currently several members of the Burke and Wills Historical Society are actively pursuing field studies relating to the track of the expedition.